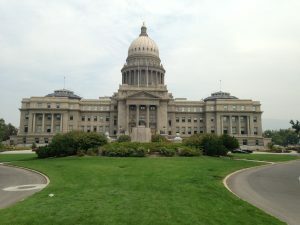 It was an easy drive to Boise on I-84. 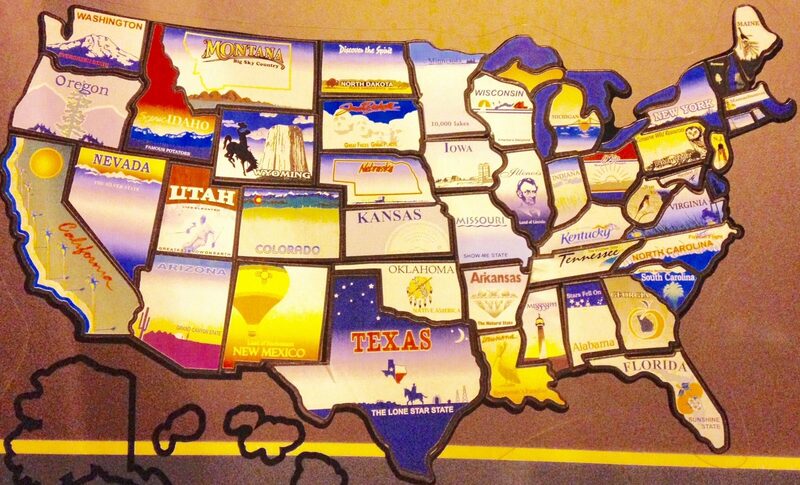 We had no complaints because the weather was good and it was interstate all the way. 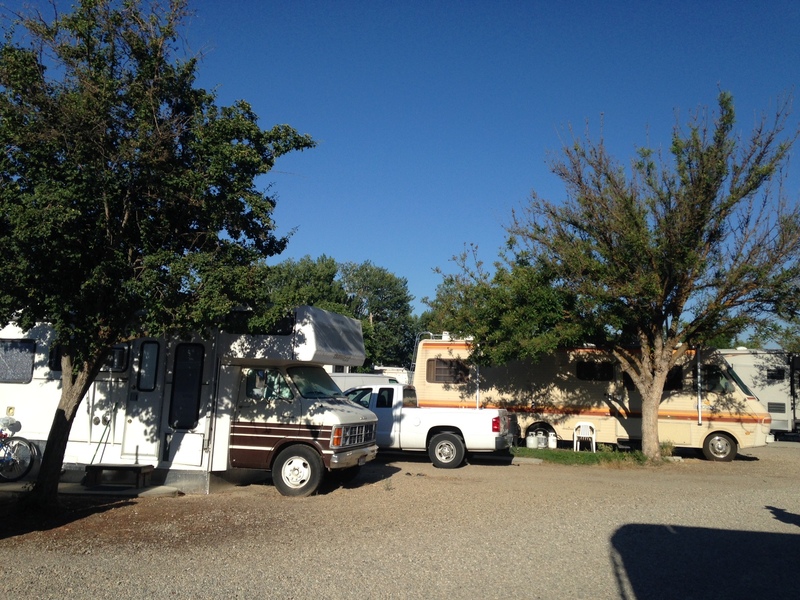 We stayed at the Boise Riverside RV Park for two weeks. The location was excellent. We were within 5 minutes of any shopping we needed. The campground was at the edge of the Boise Greenbelt Trail, so we were literally steps away from our daily dog walks. (That was a real convenience after leaving a place where we had to get in the car to take the dogs for a proper walk). 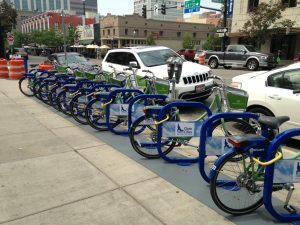 We were technically in Garden City, Idaho, but downtown Boise was a short 5 miles away, and we could get there on our bikes. The Boise River was on the other side of the Greenbelt Trail, so Mike was even able to do some fishing. Unfortunately for our freezer, he didn’t have any luck. Our actual camping spot was nothing special at all, and the park was all gravel, which translates to dust in the air at all times. In the long run, we felt like the location and proximity to the middle of town were good enough perks to trade off the negative aspects of the RV Park. 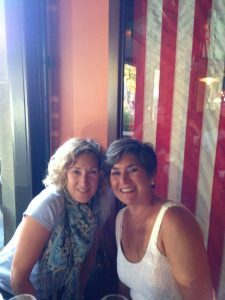 We both enjoyed the City of Boise very much. It reminded me a lot of Austin back in the day when mostly Texans lived there. The population is a little over 200,000, so it is big enough to have interesting citizens, but small enough to get around easily. It is a state capital and also has a university near the downtown area. 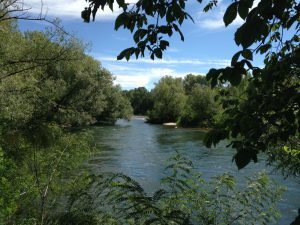 The Boise River runs right through town, just as Austin’s Town Lake links many neighborhoods to the city’s center. 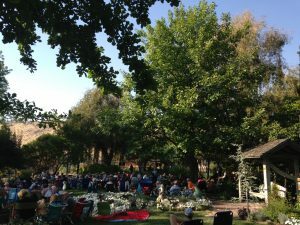 The people of Boise are friendly and enjoy outdoor activities centered around the community’s multiple public parks and green spaces. Many of the sidewalks in the city center are flanked with patios brimming with tourists and local workers or students. Lots of construction around town indicated to me that the economy was strong in Boise. There was a good energy about the place. And it was very clean. I would dare say it was one of the cleanest and most well manicured cities we have visited on our Tour. We had a relaxing time during our Boise stop. It was the largest city we had been to in a while, so we ran lots of errands when we first got there. Mike got the oil changed in the Honda and picked up some RV supplies. I bought make-up at a department store cosmetics counter and took the dogs to the vet. We also made a few other stops at stores that aren’t located in towns with populations of 5,000. We spent many hours walking the dogs on the trail, and riding our bikes toward all the action in the center of town. We floated the river one afternoon, went to an evening concert at the Botanical Gardens, and ate at several good local restaurants. 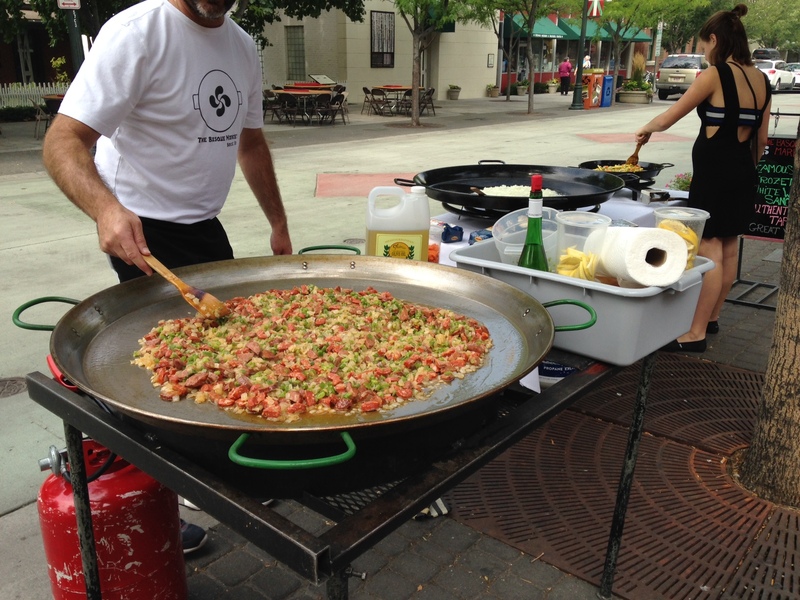 I made a trip to the downtown Farmer’s Market on Saturday morning. 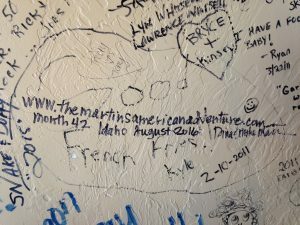 A friend of mine from my organizing life is a full-time RV’er with her husband and they were passing through Boise at the same time we were there. It was fun to catch up with Donna and Mike. 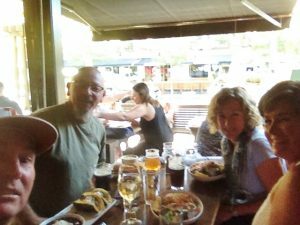 We met them downtown at the Bittercreek Ale House one afternoon for drinks and dinner, and hosted them at our place another evening. It is always nice when we get a chance to visit with people we actually know! 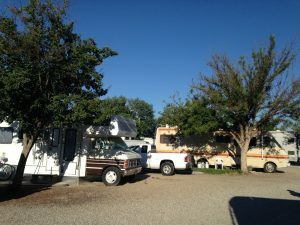 Donna has a website relating to organizing issues at www.unclutter.com, and Mike writes a blog about their RV travels called www.flyingthekoop.com. Our spot was B24. The sites were all gravel, so it was extremely dusty at all times. When I was checking in at the office, the lady behind the counter was on the phone with a potential client making a big deal about how their rig had to be 10-years old or newer. I guess these campers behind us got into the park before the rule was instated. 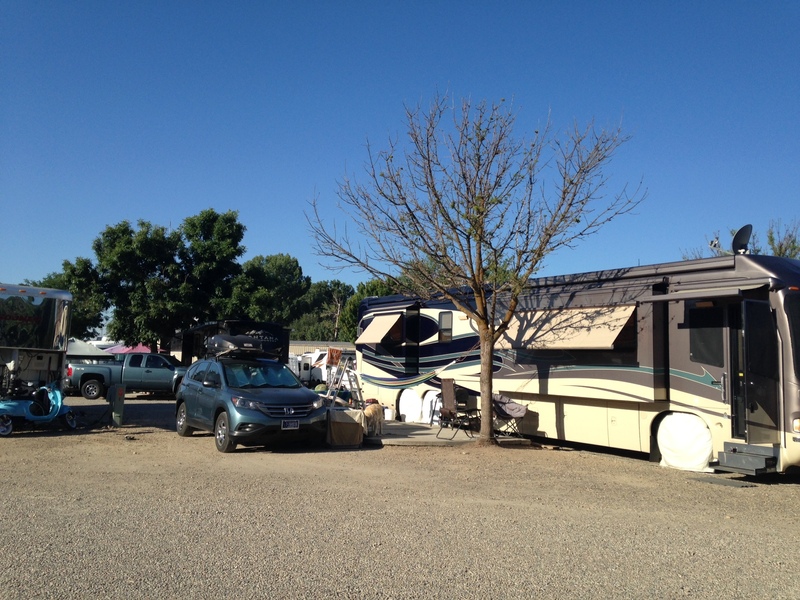 Lots of RV Parks have the “10-year rule”. Our Monaco is a 2006, but this year we started telling the RV parks it is a 2007… so we will meet the guest qualifications. (insert eye roll emoji here). We had one dead tree in our site, so Mike decided that was enough to hang my hammock for me. He strapped one end of the hammock to the tree. 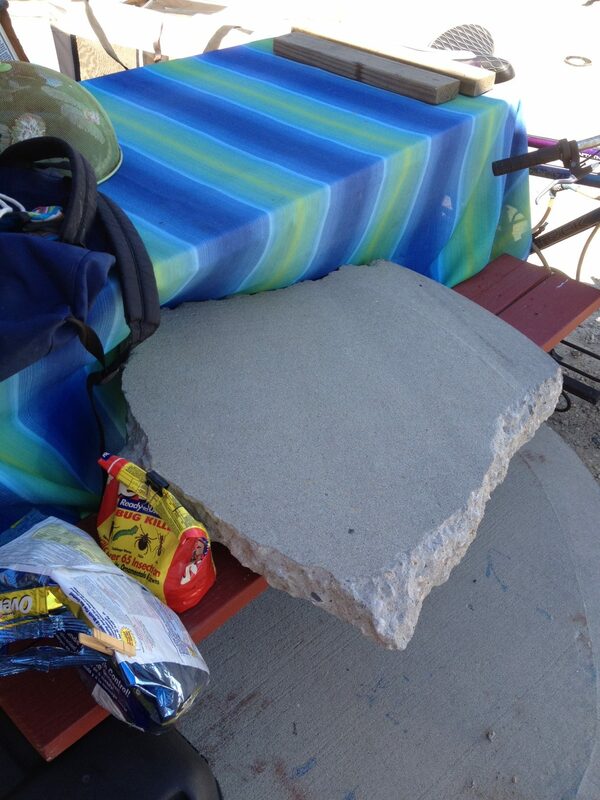 He hooked the other end of the hammock to the ladder, and fastened the ladder to the picnic table. The ladder contraption wasn’t enough to keep the hammock from wobbling when a person was inside, so we moved this concrete block onto the bench of the table and stability was achieved. The Boise Hawks are a minor league baseball team from the Arizona Diamondbacks franchise. 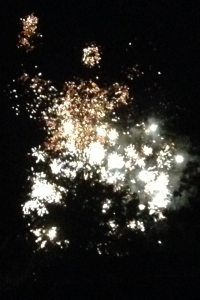 On Friday home games they have fireworks after the final inning. 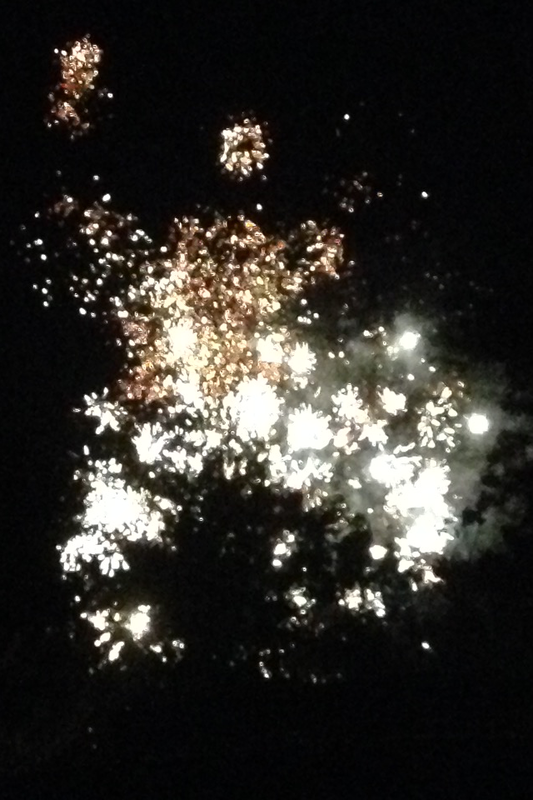 We were able to watch from our camp spot, so it was a fun treat. (Although Cessna hated all 10-minutes of it, even though she was inside with the a/c running, two stereos blaring and her white noise machine on maximum). 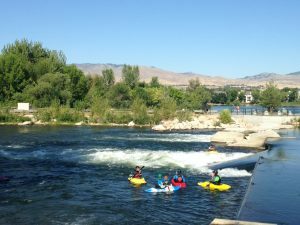 There are tons of fun outdoor activities to take advantage of in Boise. 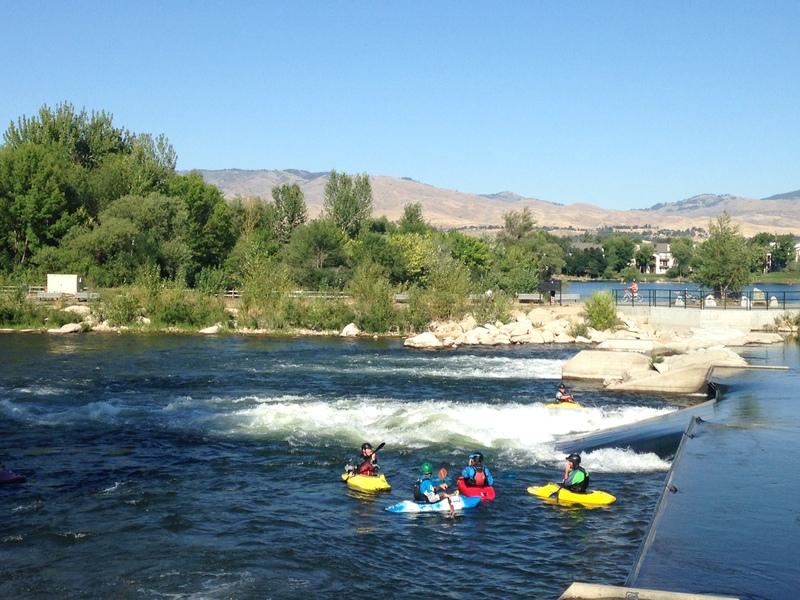 These kayakers were practicing their skills in the outflow of this small dam on the Boise River. I snapped this photo from the Greenbelt Trail. The Sandbar is a great outdoor restaurant on the River near downtown Boise. We rode our bikes over for dinner one night. 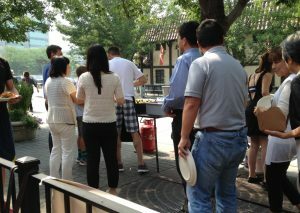 The live music was fun and the Kobe Brisket Sandwich was sensational. 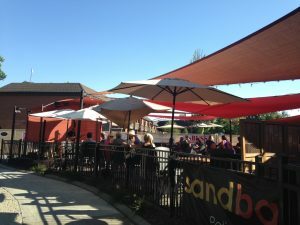 As it turns out, The Sandbar is not only dog friendly… the establishment is bird friendly, as well. 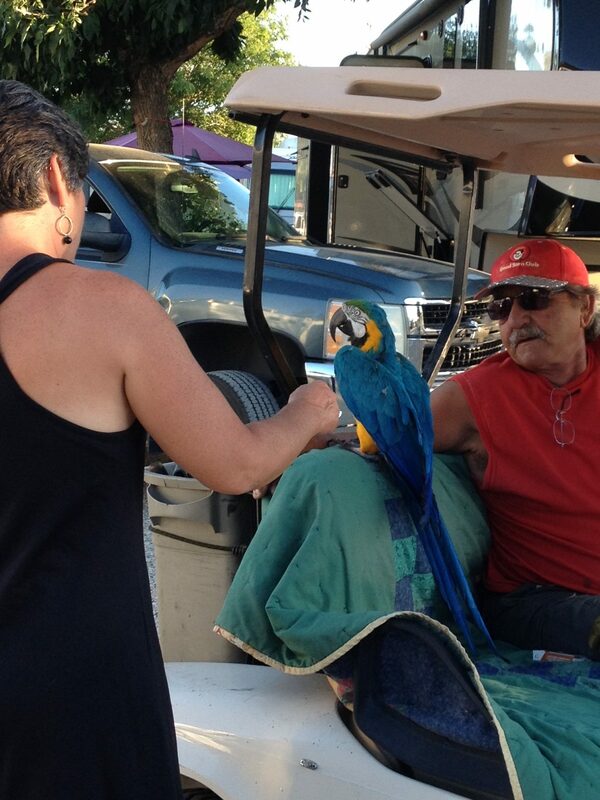 This beautiful parrot joined his owner and a big group of people at a table near the band for drinks and food. 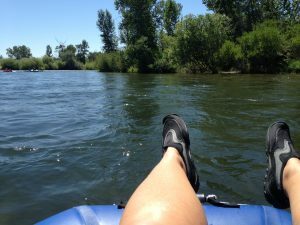 We did a river float through the middle of Boise one afternoon. The current was swift and it took us about two hours to float from Barber Park to Ann Morrison Park. 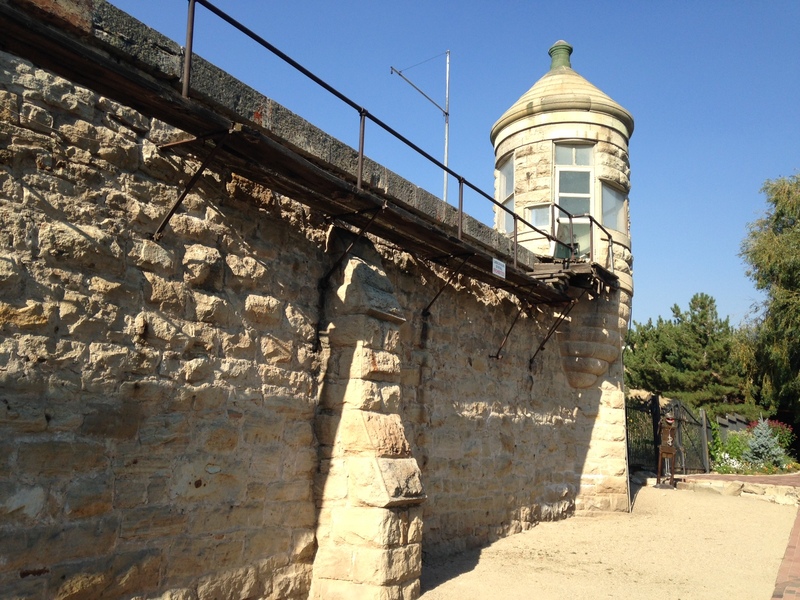 The Idaho Botanical Gardens is built around the historic penitentiary in the foothills of the city. 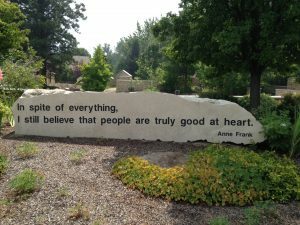 The Idaho Botanical Garden is a lovely attraction. 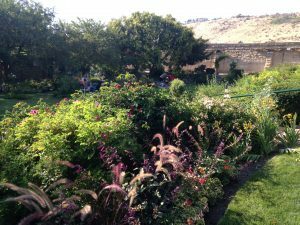 Some of the gardens include: a water conservation landscape, a vegetable garden, a rose garden, a meditation garden, a children’s adventure garden, a summer succulent garden, an herb garden and a native Idaho garden. The most intriguing garden to me was the Lewis & Clark Native Plant Garden. 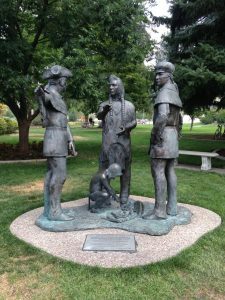 This garden’s goal is to display 145 plant species collected during the expedition between Great Falls, Montana and The Dalles, Oregon. With more than 125 of the species currently in place they have almost reached their goal. 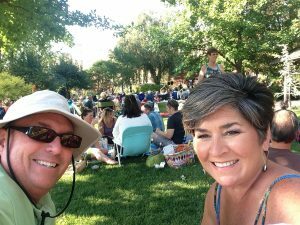 We attended a summer concert series at the Botanical Gardens. The theme was swing music. The featured singer reminded us of Rhiannon Giddens. We asked the singer during the break if she was familiar with Ms. Giddens, but she did not know of her. 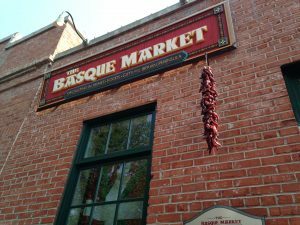 One block in downtown Boise is called the Basque Block. All businesses on this block are either museums, restaurants or markets dedicated to the Basque heritage. On Wednesdays and Fridays the Basque Market prepares Paella on the sidewalk. 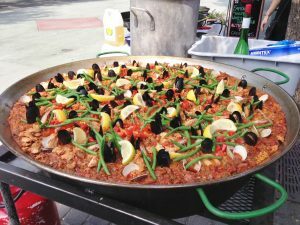 The dish is served at noon. All plates are $10, and the food is served until it is gone. (Sometimes that happens in 27 short minutes). We got there at 11:00, and I’m happy to report we were the first people in line! We shared a plate of manchego cheese with bread and apples while Mike enjoyed a Spanish beer and I gulped down an amazing frozen white sangria (or two). After an hour of yummy treats and pleasant conversation with the owner, our food was served. We devoured it within minutes! Get in line, the paella is ready! I wonder how fast they will sell out this time! 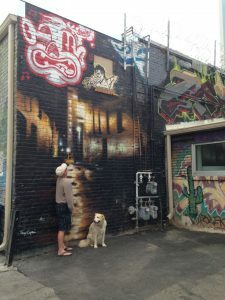 Artists pay the city to paint murals in Freak Alley each year. 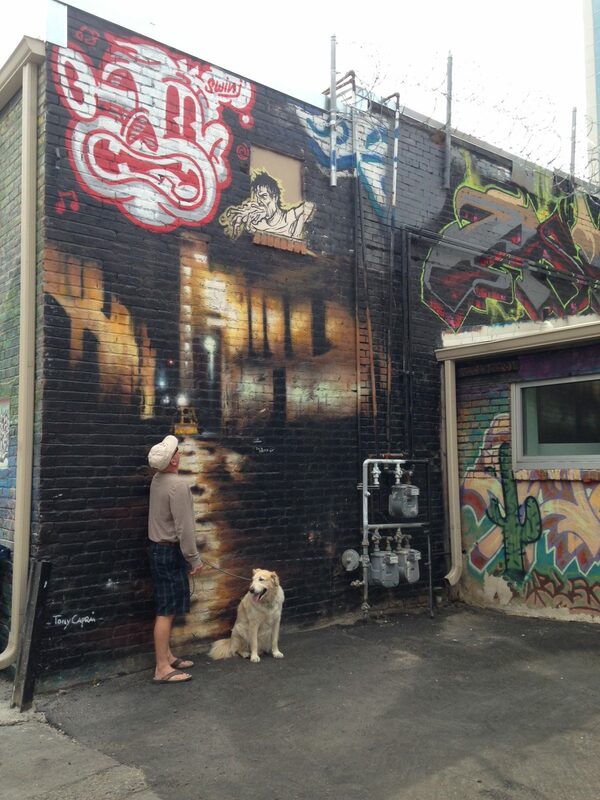 Contemplating the art in Freak Alley. 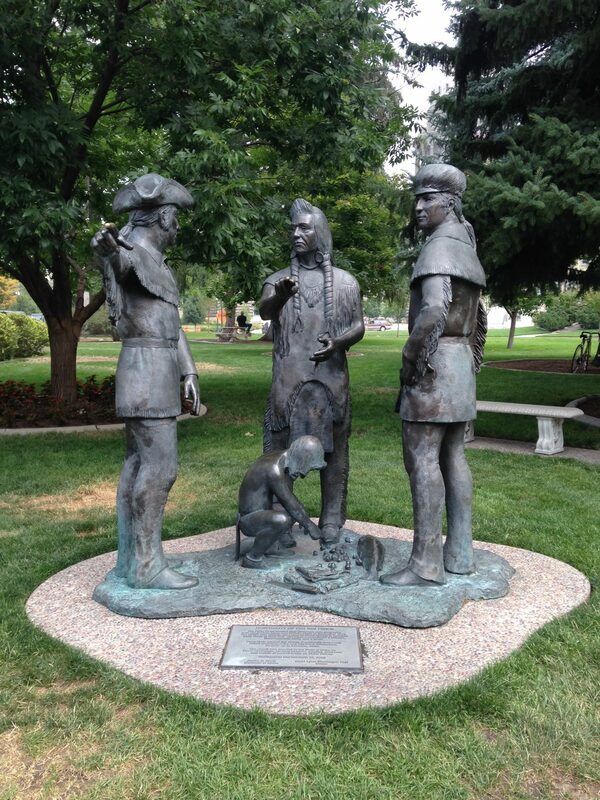 A Lewis and Clark statue on the Idaho Capitol grounds. 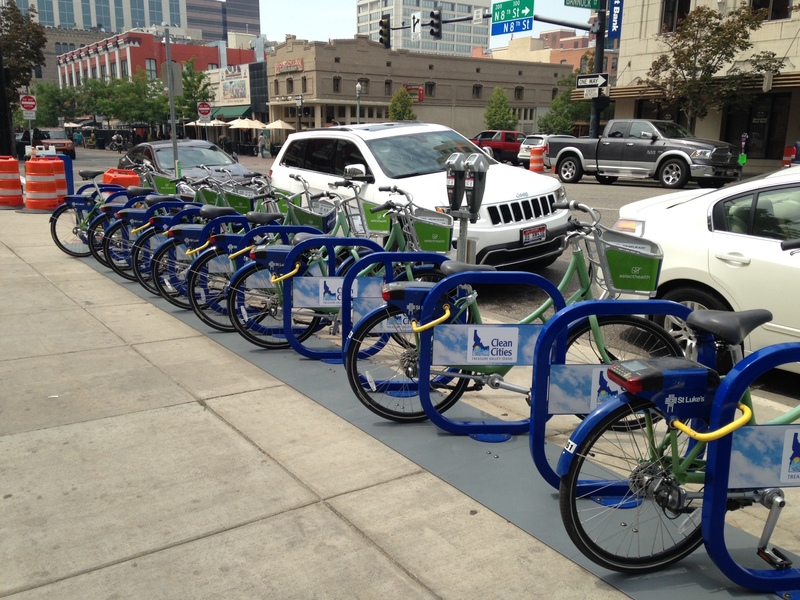 Downtown Boise has a bike share program. I love those! The Idaho Anne Frank Human Rights Memorial was situated on the edge of downtown at the riverbank. 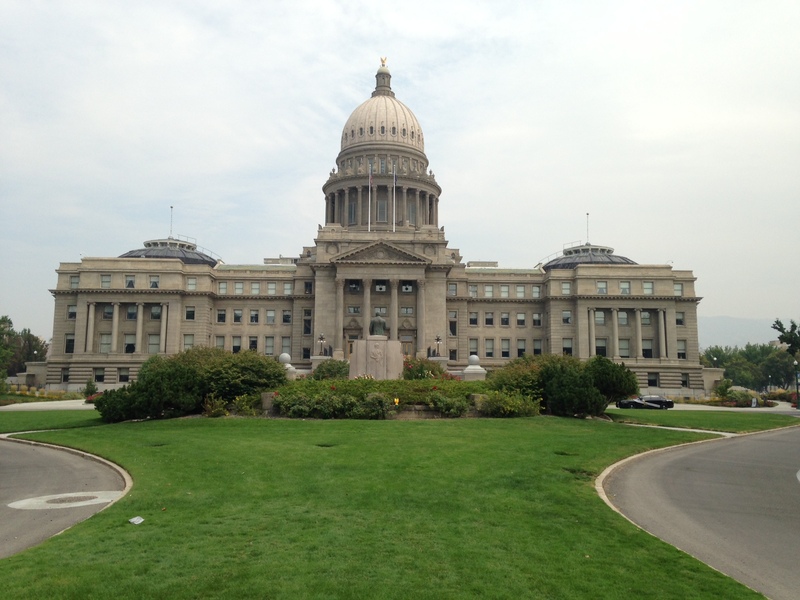 Just like the rest of America, there are many homeless people in Boise. 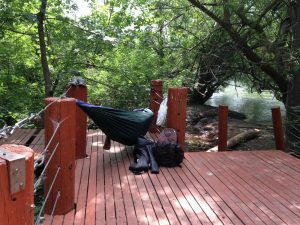 This guy had a nice set up on a park deck off of the Greenbelt. 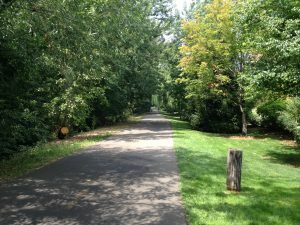 A portion of the Greenbelt Trail near downtown. Dinnertime selfie at the Bittercreek Ale House. 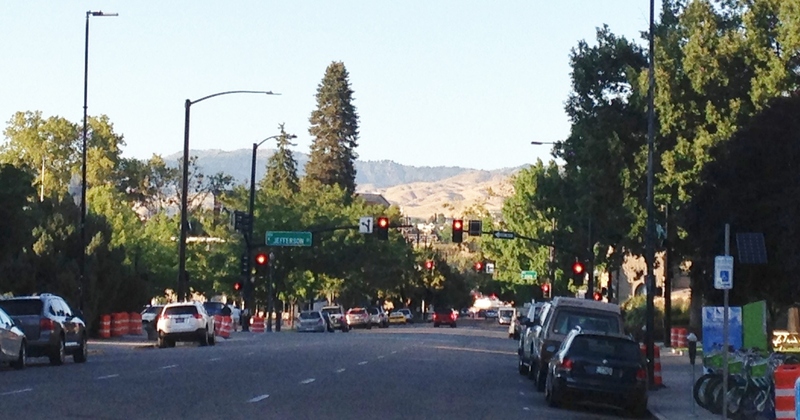 A downtown view of the hills that surround Boise. A glimpse of the Boise River from one of our many daytime walks. 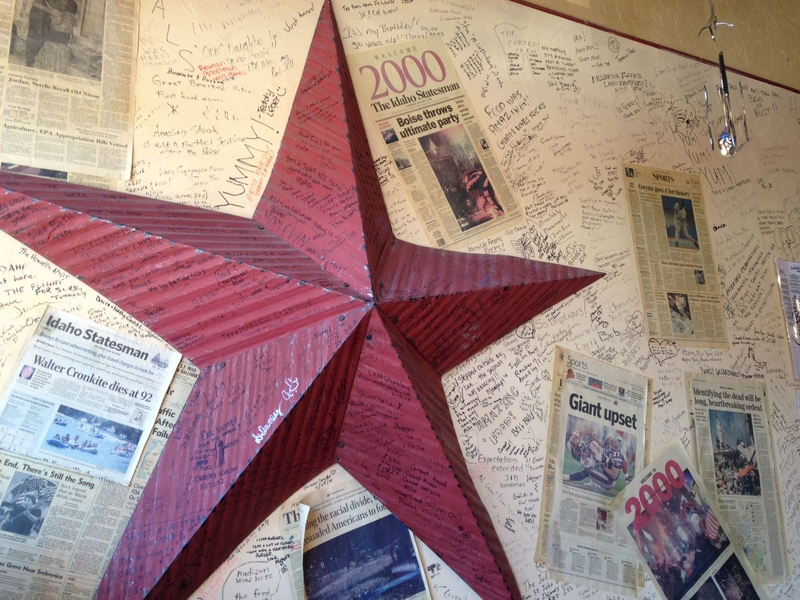 Rick’s Press Room was on Diners, Drive-Ins & Dives during season 7. We had the potato pancake, potato crusted salmon, celery slaw and meatloaf. Everything was as good as Guy Fieri said it would be! I’m going to have to look back at my notes and pictures to determine how many walls we have signed since our Tour began. Boise and birds. This one lived at the campground. I stopped to visit him as he was making evening rounds with his human. 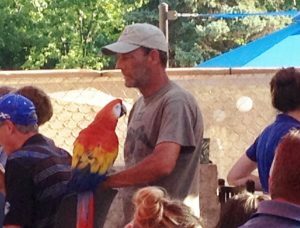 After I loved on him for several minutes, he pretended to bite me and then he laughed and laughed… The bird, not the owner. 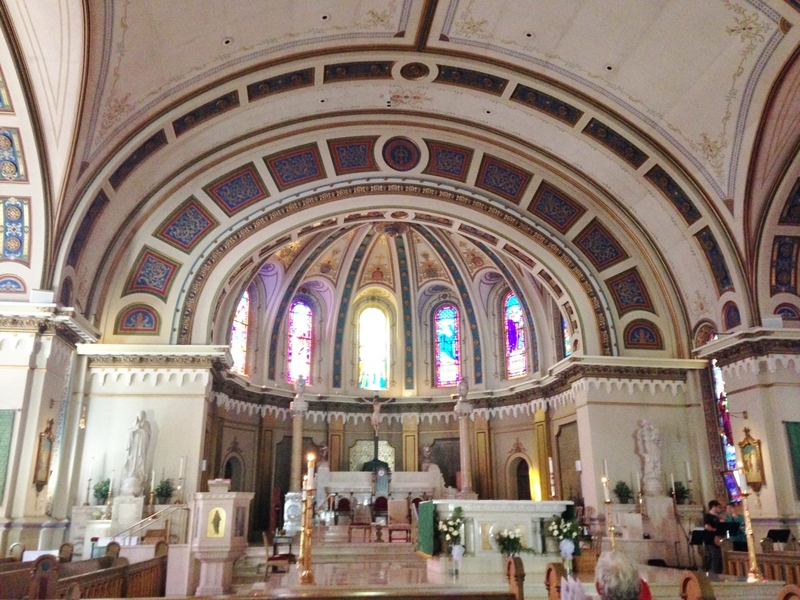 I went to mass at St. John’s Cathedral one Sunday evening. 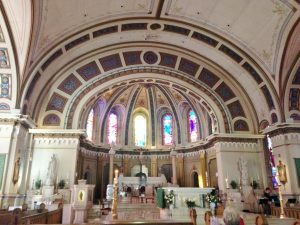 The air conditioning was broken and people were hot. 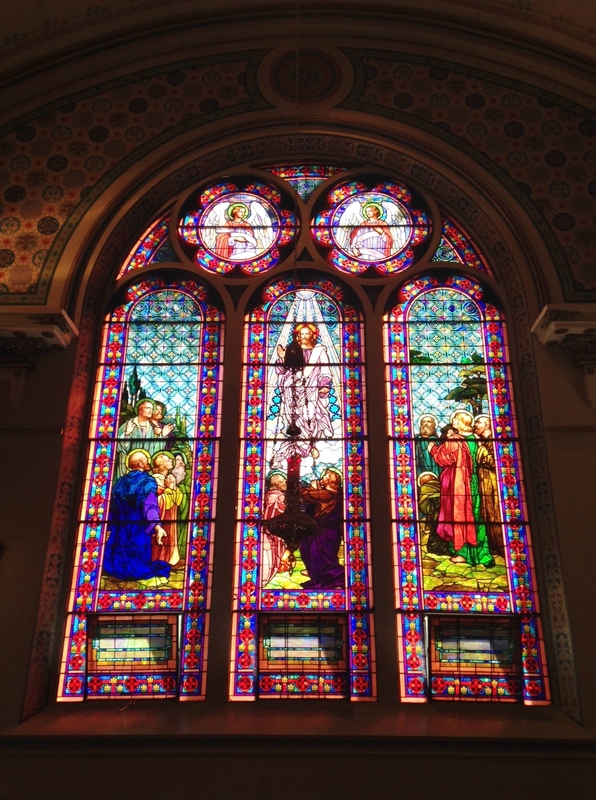 I didn’t think it was too bad, but the priest skipped the homily all together. Just told us to concentrate on being good citizens until we saw him again, and then moved right on into the next part of the service! One of the beautiful stained glass windows on the side of the Cathedral. 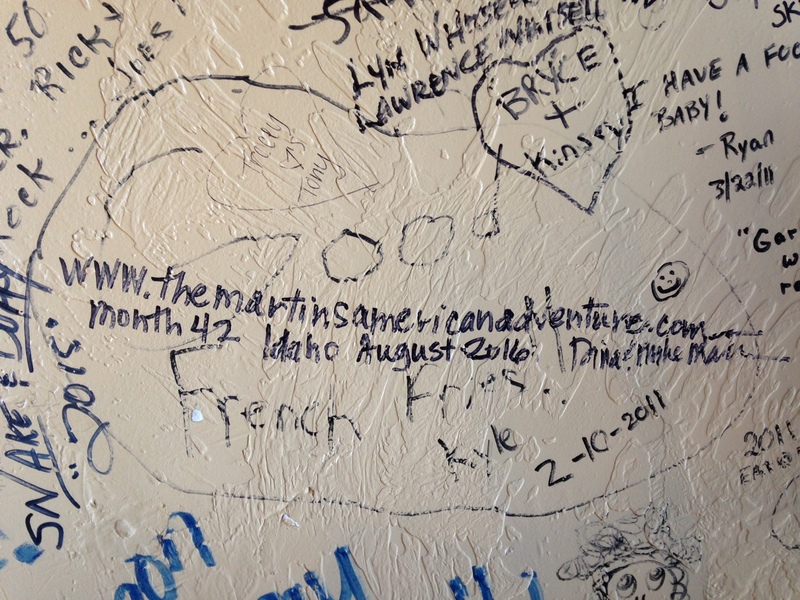 This entry was posted in Idaho on August 22, 2016 by Dina Martin.